We had Mica's Kindergarten conferences. Next week we have Isaak's preschool conferences. First of all I have to say that I was so happy that we didn't have to get a babysitter. They just sat in the hallway at a table and watched a movie on the portable DVD player. I love those things! Mica's teacher was very pleased with his progress. She said he is at the top of his class right now. Academically he's doing very well. He does have a problem chatting with other kids. She says it wouldn't bother her if Mica and this other kid got their work done. The problem is, is that Mica does get his work done and the other kid is unable to. Then Mica's teacher pulled out a self portrait Mica drew of himself. All the portraits stayed at school because they are getting hung up. I so wish I would have grabbed my camera and shot it! I could NOT stop laughing! It has a very pronounced unibrow. I've always said that Mica will need a bit of plucking when he gets older. 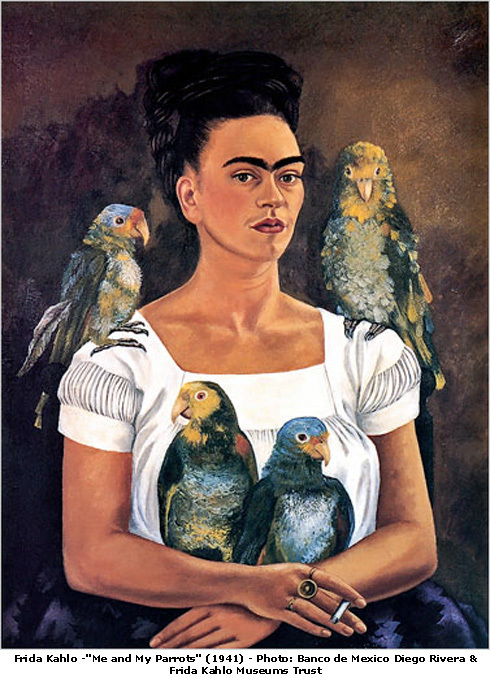 The portrait reminded me of a Frida Kahlo painting. Have you ever started laughing so hard that you can't stop? That's how I felt when I saw Mica's self portrait. It was cute, funny and clever all at once. Mostly I couldn't get past the unibrow. I had to force myself to stop thinking about it in order to be more serious. Mica writes well, draws well and reads well. His teacher encouraged us to have Mica do something for the science fair coming up. Daddy is helping him make a record player. It's something I'm not supposed to know about. I'm kind of anxious to hear what Isaak's teachers will say about him next week. He's so the type of kid that says, "I can't do it!" all the time. I don't know if it's a stage, or if that's just how he is. I'm hoping it's a stage! I've been doing my best to not do things for Isaak. I pretend that I don't remember where his toys go and I forget how to dress him. That's fine when we have the time. At other times I just need to get to work, to the Y and so on. We have to hurry up. Kids have no concept of what, "Hurry it UP!" means. I think they move SLOWER when it's time to hurry it up! LOL ... I had to laugh at the unibrow. Maybe you will be able to show us a picture of it later. I have a Granddaughter that thinks going to school is for social time, not learning time. She is now in college and needs to buckle down. The other Granddaughter studies so much that she doesn't get much else done. They definitely DO go slower when it's time to hurry. Ash say "I can't" a lot too. We'll both keep our fingers crossed it's a stage/phase.